Right: Easter Island in Devon. No, not the journal, surprisingly, but the wonderful, variable, adaptable palm. Part 3 of your Editors unflagging and determined efforts to bring not only excitement to your lives, but new species of Trachycarpus too. This time Burma and Nepal. Gosh! No, not Australia! 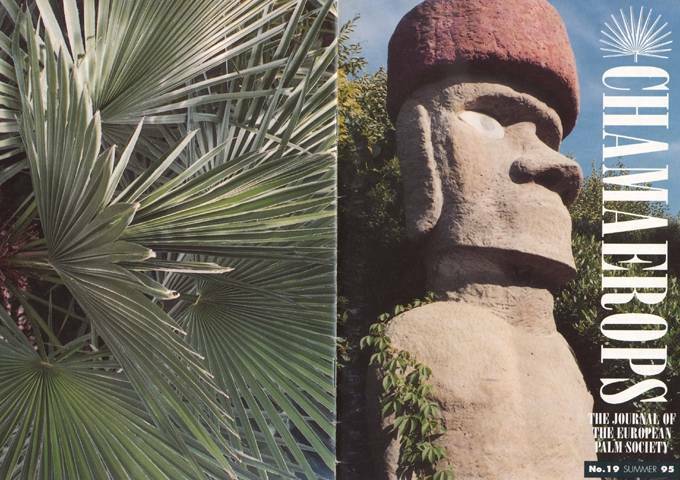 Not normally thought of as the kind of place you might find palms, Robert describes the joys and problems of 'sub-tropical' gardening in the skiing nation. First in what is hoped will be a series of 'meeting palm people', Philippe tells his (palm-) life story. A reminder that winter is just around the corner, Gary sets a few myths about cold-hardiness to rest. Nice pics kindly provided by Helen & Wilko from Holland. Brrrrr! In marked contrast to the preceding, globe-trotting Dr. Teege takes us on a trip to the Indian Ocean, where the word frost isn't even in the dictionary.